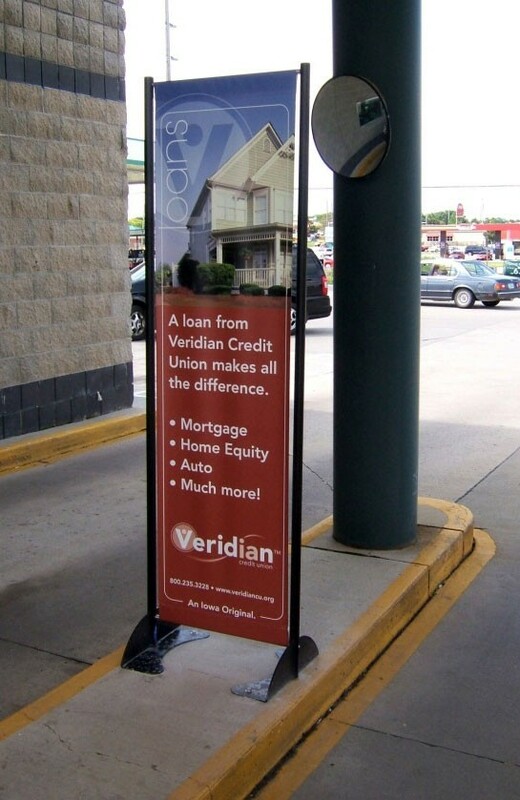 The Messenger outdoor banner stand is designed to be permanently bolted to concrete, wood, or other surfaces for long term outdoor display applications such as bank and credit union drive through lanes and parking garages. The Messenger is available to hold 16", 18", 20" or 24" wide x 72" tall banners with pole pockets. 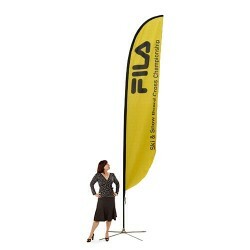 -- Please Select --16" 18" 20" 24"
Is this banner stand adjustable? No, they are all 72" tall and have a fixed width, although it is available in 4 different widths from 16" up to 24". 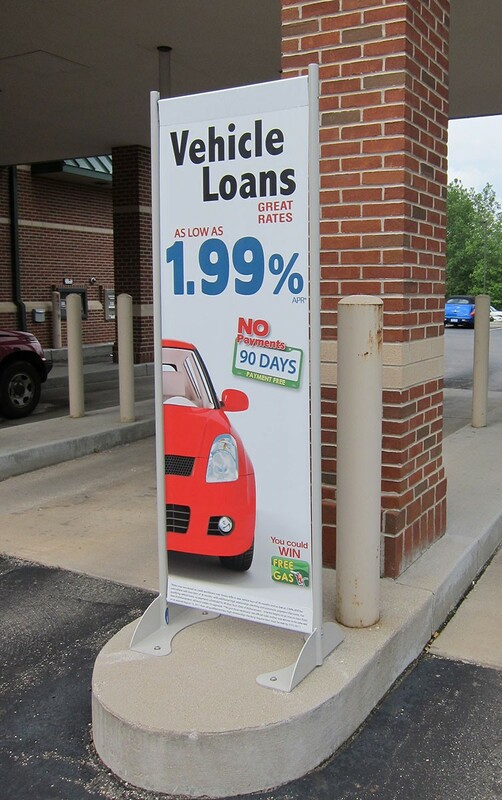 The Messenger outdoor banner stand is designed to be permanently bolted to concrete, wood, or other surfaces for long term outdoor display applications such as bank and credit union drive through lanes and parking garages. 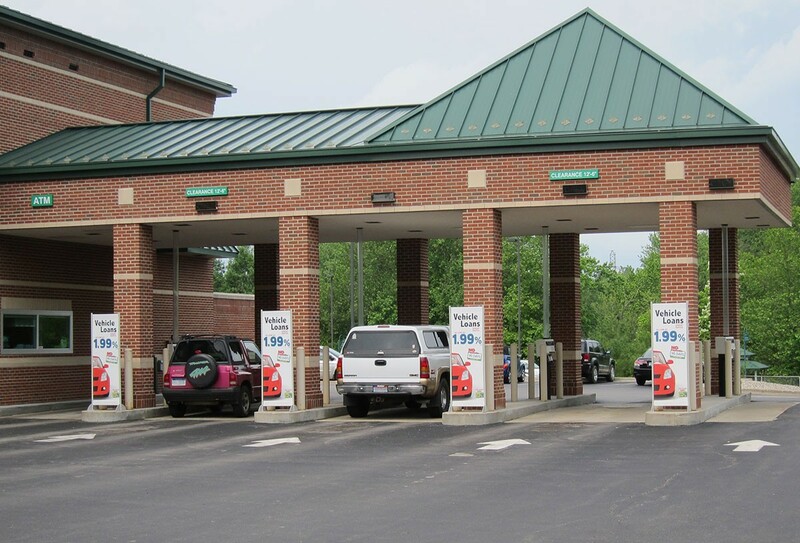 Considering the large volume of customers that pass through credit union and bank drive through lanes, the Messenger is an extremely cost effective way to market to these customers, and is excellent in any high traffic area where marketing messages have a chance to be seen, such as parks, stadiums, zoos, or exterior retail signage. 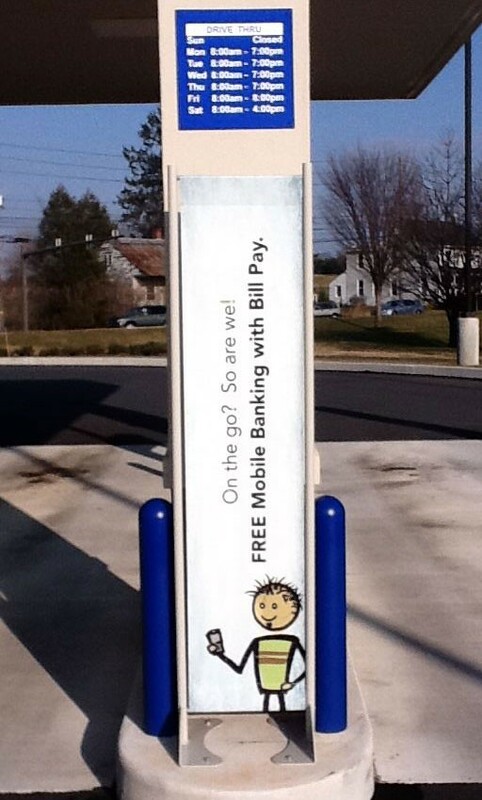 While the stand is permanently installed, the banner can be easily changed when it's time for a new marketing message. 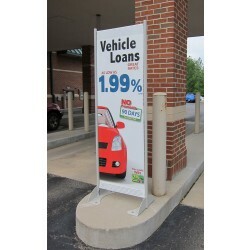 This outdoor banner stand is made in the USA of powder coated aluminum to hold up to the harshest weather conditions without rusting, and features stainless steel bolts including tamper resistant hex head fasteners to help prevent banner theft. Available in black or gray satin finish, the Messenger uprights have a slot in top of each pole with internal springs. The top cross bar is inserted into the pole top pole pocket of the banner, and it has special ends that fit into the slots in the uprights. When the top cross bar ends are inserted into the uprights, they rest on the internal springs that provide tension to keep the banner tight. The bottom cross bar is inserted in the bottom pole pocket of the banner, and can be attached in one of three spots at the bottom of the stand. This provides a way to control how much tension is on the banner, and also helps allow for up to 1/2" variances in the banner size that would otherwise allow the banner to sag or fit poorly. The Messenger includes a 2 year warranty and is designed to withstand winds up to 60 mph. If severe weather is expected with winds in excess of 60 mph, the banners should be removed to prevent damage to the banners or the stands. Please note, the warranty does not cover damage from flying debris, moving objects or misuse. Banner options are shown for the most popular options that we think work the best, but we have many other materials that can also be used. If you would like a different banner than those shown as options for this stand, browse through the Banners category under Printing for Outdoor Use from the main menu above where you can choose any banner material you would like. The Messenger outdoor banner stand is available in widths to hold 16", 18", 20" and 24" wide banners, to accommodate most drive up lanes and outdoor venues. Each unit holds a banner with a finished height of 72". 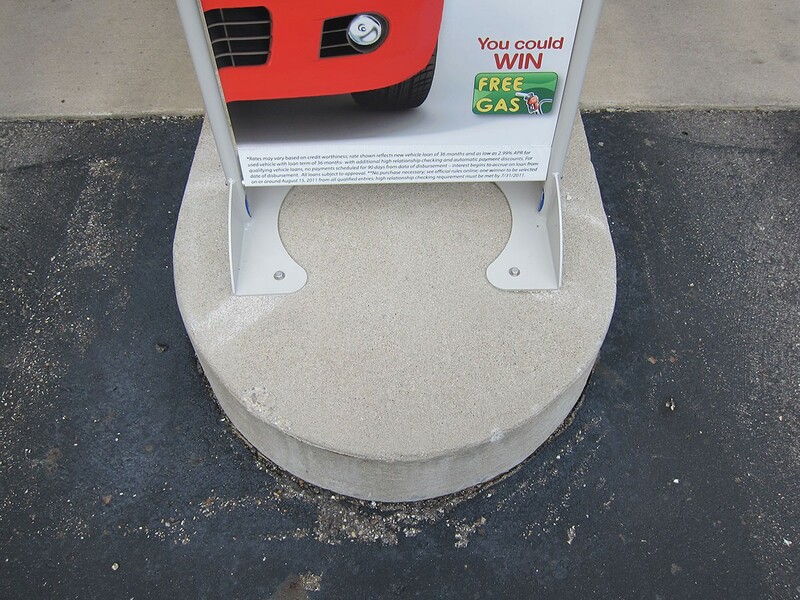 There isn't a higher end model of outdoor banner stand for permanent ground level mounting. We have many less expensive outdoor banner stands, but none that are designed to be permanently mounted to the ground like the Messenger. Banner width: 16", 18", 20" or 24"
Shipping size: 80" x 18" x 7"